This image was taken on my recent visit to the National Railway Museum (NRM) York. The Search Engine personnel kindly provided this for me to view/photograph during my pre-arranged visit. 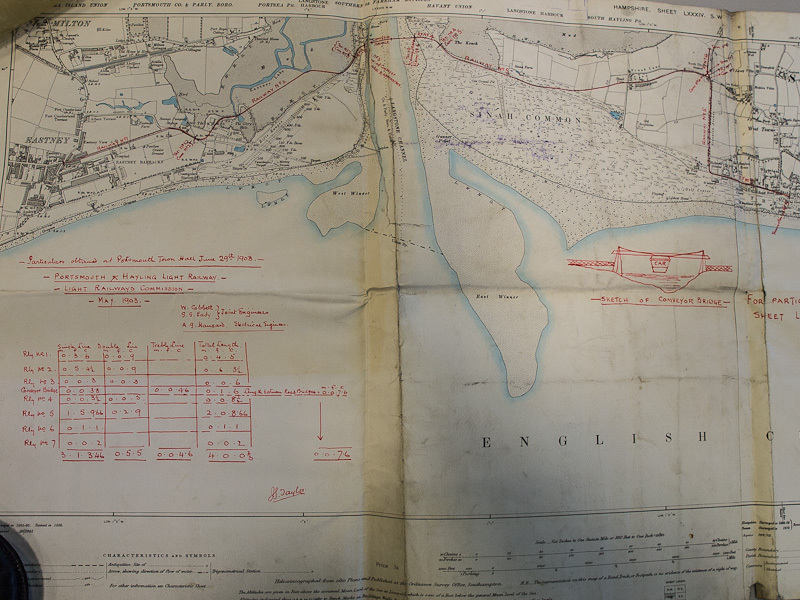 This map was probably part of the 1900 application (see this article http://haylingbillyheritage.org/industry/transport/the-proposed-tramway/) to create a light railway and Conveyor bridge between Portsmouth and Hayling Island. The markings on the map show the proposed route from Eastney in Portsmouth to a point near to the current Fun Fair (not as far as Eastoke which appeared in the application to Parliament), with spur reaching the railway station in West Town. This venture was killed off because of strong opposition from the Islanders.